In a bid for a change of pace we decided to try 2 manning Hellfire Ramparts this morning. I really wasnt sure how far a lv 64 enhancement shaman and a lv 64 prot warrior would make it, but we surpassed my expectations. The trash went smoothly as did the first boss, although he failed to drop anything useful (cloth spell damage shoulders which went into my healing/spell damage set). We bravely fought on to the 2nd boss and thats when disaster struck. Our battlegroup fell over… so we will have to go back another day, but all in all, it went pretty well. In other Orc related news, we have completely finished Zangamarsh, half done Terrokar and started doing Nagrand. I also got ganked twice, once in Nagrand by a horrible little dwarf rogue who we could have killed whilst he was afk destealthed and once in Terrokar by a 70 hunter, also a dwarf, who if he hadnt potted or run through a pile of mobs i would have killed. If if if, but it certainly seems that dwarves hate orcs… i feel victimised. The Orclings finally hit 60. Its taken a while and now Im relieving how painful Hellfire is for 2 melee classes. Its half tempting to respec to elemental but my gear just isnt up to it at the moment. In other news I got a spirit of competition on this toon as well, although it was about as far from the spirit of the Olympics as you can possibly get… zerging 11 alliance with 40 horde. 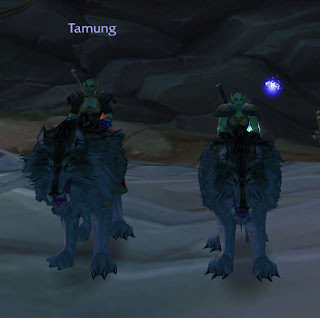 Ah well, it helped us get our matching Frostwolf Howlers. Ive been working on my little list over the last few days and I think Im actually making headway. The Orcling is lv 51 and counting, we managed to break through the Badlands into lusher and more interesting zones which really speeded up the leveling. The screenshot is the only good screenshot of the Badlands, me leaving it. Got the Rune of the Guard Captain. A task made slightly harder than it should of been by the fact I was 5 levels lower than the mobs and Tamung was using a brand new weapon and so couldnt hit them. 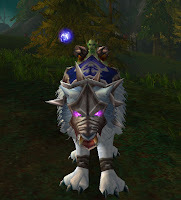 I wish the Alliance had a version of this trinket. Hit Alterac Valley for the first time earlier today. It turns out that in the 51-60 bracket in Cyclone is really biased in favor of the Horde. Got 500 honor in 10 minutes along with 25k experience for completing a few of the quests. I also got to upgrade my main hand by getting the mace from the kill Vanndar quest. Its just a shame the queue times are horrible, but since the alliance get slaughtered 15 to 40, I suppose we can hardly blame them. The Orcs finally hit 30. Windfury, Astral recall and mounts, have to say im a happy orcling. 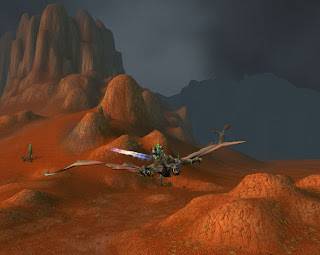 Hoping the horde version of the call of wind quest is more challenging and fun than the alliance version. 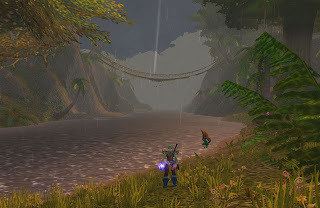 Last night we hit Razorfen Kraul to see if we could complete Tamung’s warrior quest. Both lv 28 so we were a little nervous but as it turned out, our only issue was our inability to read quest text correctly. I was under the mistaken impression that Overlord Ramtusk was our target (pure coincidence that he drops the Corpsemaker… honestly). So after slaughtering him and getting my precious corpsemaker we had a look at Wowhead to discover our real target. All in all, it took us around an hour, would have been less had we known where we were going, got me a nice blue axe, around half a level of experience and of course the warrior chest we went in for. Its not just anti-socialness, but I have to admit I do like soloing or rather two manning stuff. Its far more fun and challenging than doing it with a full 5 man party. It also gives flexiablitity, if we get too tired or grumpy we arent letting anyone else down.